anyone that may need some assistance. Our documents will take you step by step through installing AD FS and IFS and configuring Landmark, Landmark thick client, LSF, LSF thick client, Lawson Smart Office and Mingle. Of course, if you would prefer we do it for you, simply contact our sales team for a services quote. Register for your free copy and we will email the documents. 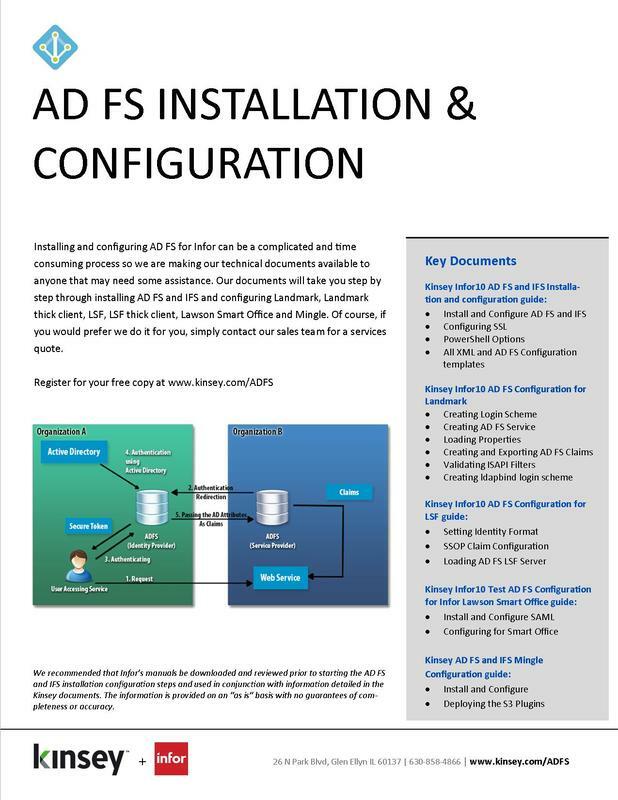 We recommended that Infor’s manuals be downloaded and reviewed prior to starting the AD FS and IFS installation configuration steps and used in conjunction with information detailed in the Kinsey documents. The information is provided on an “as is” basis with no guarantees of completeness or accuracy.